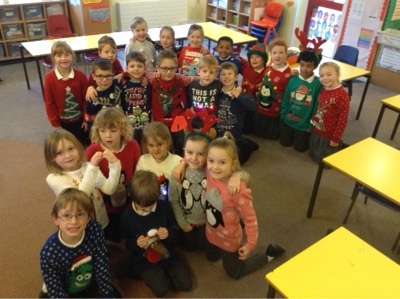 Christmas Jumper Day........ and a HUGE THANK YOU to the PTA! 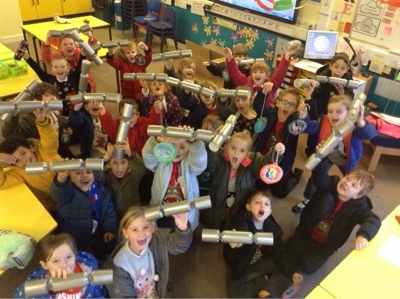 Thank you to the PTA, who made sure that we all had a Christmas cracker to take home today. We have made it back home. Thank you so much for having us, we had a great time helping you learn. Remember to keep trying with your writing. When we next see you, you will be in year 3! Can't wait to see how much progress your writing has made by then. As you can see we have been up to no good back home. Santa has already had to tell us off for tricking the penguins! He He! 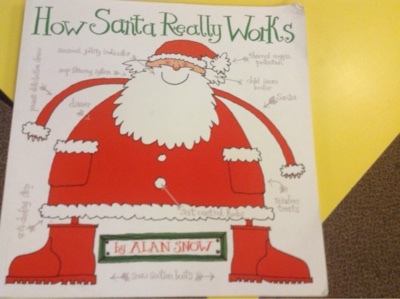 We had great fun using this book in our Literacy lesson today. The illustrations are fantastic and full of detail. 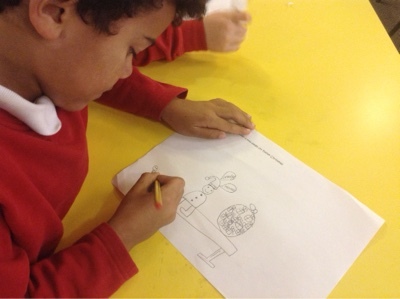 We chose whether to design a new sleigh, or a new suit for Father Christmas. 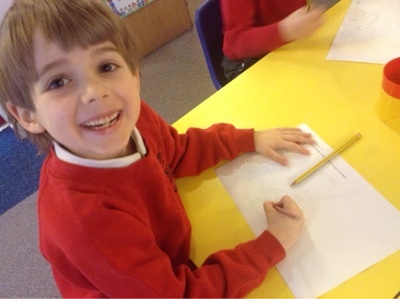 Some fantastic ideas! Well done Walnut Class inventors! 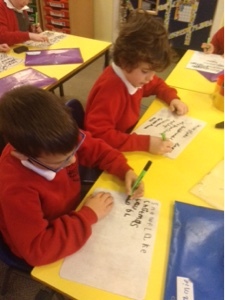 Mrs T wrote lots of letters on the whiteboard this morning, and we had ten minutes to write as many Christmassy words, with our partner, as we could think of. We did our Thursday rotation with a bit of a Christmas twist. Rocky and Sidney - We're Home! What lucky things Rocky and Sidney are! 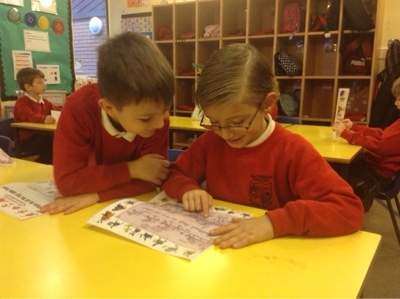 They were spoilt by Walnut Class with gifts, letters and cards to take home to the Arctic. As well as making some food for Rocky and Sidney to send them on their way, we all made our own little packets to take home for Christmas Eve. We put them in our festive Christmas bags which we have been filling up this week to bring home tomorrow. (Grown ups: all ingredients are edible so will do no harm to wildlife if you sprinkle it outside on Christmas Eve). Rocky and Sidney had a conundrum. 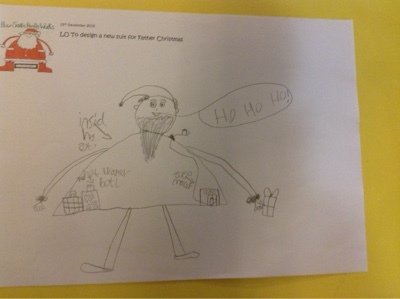 Santa had been spotted over Shaftesbury by Mrs Jones in Year 6. He was preparing to pick them up! 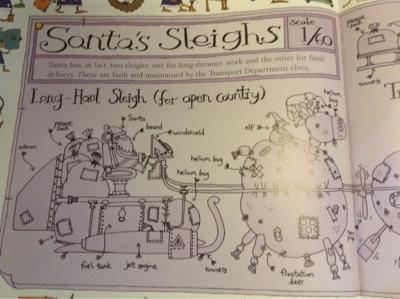 But there wasn't much room on the sleigh. 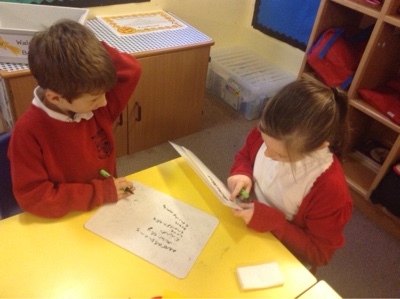 They had to narrow down their selection of items to take with them to only 3 - Walnut Class had to help them out. 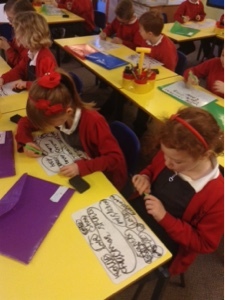 We worked in groups to choose the three most important items - we all had to agree what they were. 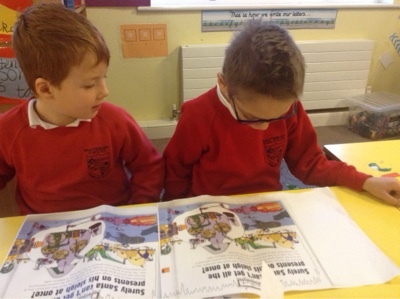 Then we had to convince Rocky, Sidney and Mrs Turner that our choices were the best by giving the most convincing reasons! The winners were a torch to help them to see, a blanket to protect them from the cold North Pole air and a tasty hot chocolate to give energy and present thirst. One of our INSPIRE targets is to work in a group co-operatively - we all did this so well that lots of gems were awarded for our jar. Yum! Rocky and Sidney were not very good at writing Snowman Pop instructions! Mrs Turner got in a right old muddle! 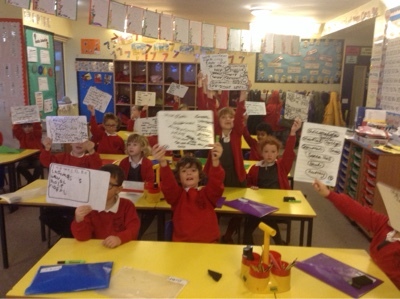 Luckily, Walnut Class were on hand to rewrite the instructions to include verbs and adverbs. Then we followed them to check we were right. If we were, we got to eat the result! The ladybird ate a pancake! 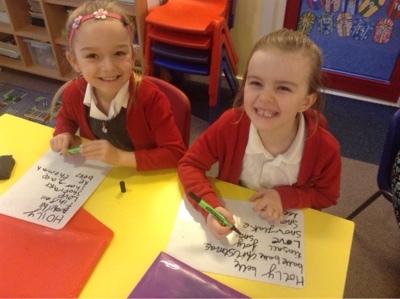 Plurals ~ some important rules to remember! 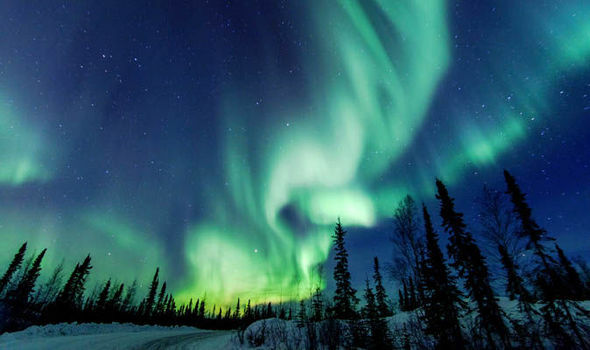 Where do Christmas presents really come from? Someone is trying to rule the school! Why Bother Learning Your Times Tables? Dec The Halls...... well.....Walnut Class!